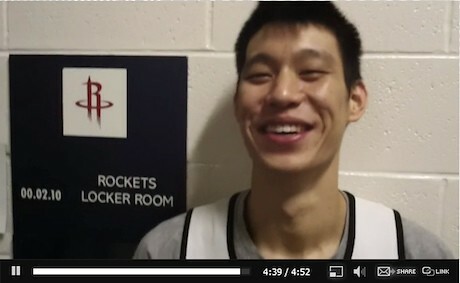 Rockets.com posted a video on Tuesday of an interview with new Rocket Jeremy Lin. You might remember the Rockets signed Lin last week (details here). Click this link or the image below for the video (a new window will open). With all the drama that went on with Rockets Luis Scola, Kevin Martin and Goran Dragic over the past few days with the proposed Lakers-Hornets-Rockets trade being rescinded by NBA commissioner David Stern, there was some refreshing and happy news when the Rockets surprisingly signed Chinese/Taiwanese-American Jeremy Lin. For Rocket fans who are Asian-American sad that Yao isn’t representin’ any longer, having Lin around gives them something extra to look forward to. 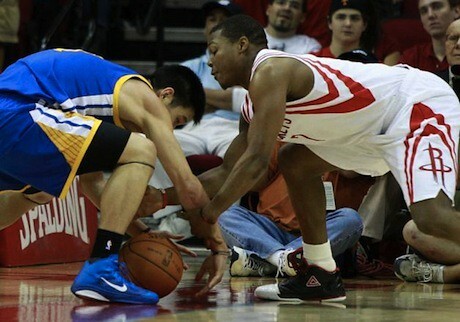 Lin was released from the Golden State Warriors on the first day of training camp. Apparently the Warriors are trying to save as much money as they can so they can have a better chance of landing a high-priced free agent. Lin’s contract pays him $800,000 this year. More details about Lin’s release is here. Here’s a link to a short article in the Houston Chronicle about Lin’s signing. Here’s a video of Lin meeting Yao Ming in Taiwan (around the 1:10 mark) during Yao’s charity basketball tour in the summer of 2010 (and throwing down a dunk at the 8:10 mark), and photos of his meeting are here. Update: Here’s a video brought to our attention from a commenter below of Lin being interviewed as a Golden State Warrior, along with his coach and fellow players. Another day is done at the Rockets’ training camp in Austin. Here’s a photo of some of the Rockets’ heavy hitters after practice all in one spot (which is unusual to see): Luis Scola, Chase Budinger, Aaron Brooks and Yao Ming. You can tell they’re working pretty hard by how fatigued they look (Yao is on the phone). Yao said he practiced with the team about the same amount of time he’s been doing all week, which is about half of the team’s scrimmage. Because Yao goes to the practice facility so early in the morning, I asked if he’s getting enough sleep since he’s working out harder during training camp getting his body prepared for the regular season. Yao replied he is getting enough rest since he’s really not doing anything other than staying in his hotel room at night. Furthermore, the Rockets’ director of strength and conditioning Darryl Eto said that most of the players are sore having worked so hard in Austin. After practice, many of them go down to the training room to take a cold plunge in an ice bath that goes up to about waist high. That’s probably why Yao is wearing sweats in the above photo since he mentioned the other day after practice that the gym was a little cold, and putting half of his body in ice probably would make him colder. I got a little bit of video with Yao’s backup, Brad Miller, and his new (and former) coach Rick Adelman. In the video, Adelman refers to “J.T.” which is Jermaine Taylor. Today in Austin, Yao Ming didn’t work out with the team, given a day of rest that has been part of the ongoing plan. But we did speak to Rockets’ head trainer Keith Jones that each day, including today, Yao comes to the Austin training facility around 8am to do strengthening exercises, long before team practices start around 11:30am. Yao is living up to his reputation as being one of the hardest workers in basketball. Jones also said the training and conditioning staff can tell that Yao has improved every day, even if Yao himself may not have felt it. It’s those little exercises they have him doing every day that’s helping him run more naturally…better and more physiologically than maybe he’s probably ever run in his life. Below is an interview that coach Rick Adelman had with the media after practice. There’s too much stuff to transcribe, but he talks about the meeting the team had with league officials yesterday at their hotel. Essentially, the bar has been lowered on the types of technical fouls they will make against players who get too far out of line this season protesting calls. At the end of the video, Adelman talks about Yao and some of the challenges they face with him being out for so long, and scheduled to play limited minutes. Today Yao slightly rolled his ankle during training camp, about halfway through the scrimmage, right about the time he would have stopped anyway. He said it’s no big deal and he should be able to workout tomorrow. Here’s today’s video interview of Yao from Day 3 of Rockets’ training camp in Austin. You’ll get a kick out of his response to the last question. And in case you missed it, the NBA tweeted earlier today a link to another article about Yao’s visit to a hospital last Friday to visit a Chinese child who had open heart surgery. His dream had always been to meet Yao Ming, and Yao made that dream come true. Here is more video that I was able to shoot yesterday (Tuesday) at the Rockets’ training camp in Austin. Unfortunately, Yao wasn’t available for interviews since he was in the training room getting standard treatment. But there are 4 more days left of camp here, so I’m sure I’ll have more video of Yao to post here sometime during the rest of the week. Here’s Courtney Lee, who mentioned that he’s been playing alot of “1” (point guard) during training camp. That’s interesting since the Rockets already have three in Austin (Aaron Brooks, Kyle Lowry, and Ish Smith). He responds to the question about him playing the “1” in camp. YaoMingMania was there for the first day of Rockets training camp in Austin. I have posted some interviews I recorded, and will update this post with new interviews I find from other media members who were there. 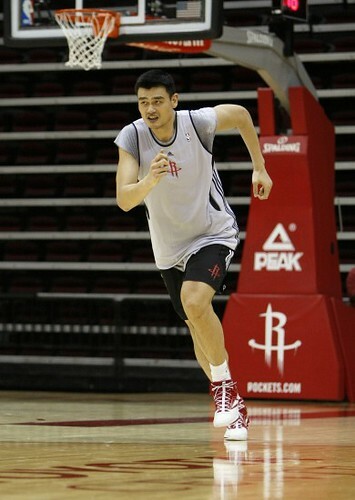 Click here for more photos of Yao at Saturday’s practice. “Words cannot express how happy I am. I can’t say if I was the first guy here (for the 1 p.m. practice), but I was here at 9 o’clock. “I was really pleased with Yao. He was able to do a lot of things today. Now we’ll see how he responds tomorrow — if he can walk. “For the first day, he probably did a lot more today than he did in a week. We’ll have to be real careful watching tomorrow. “He’s just such a force around the basket. He can score. The biggest thing is getting his balance and his timing down. The ball comes off the boards, for instance. He might be a count late to get it. He’s not reacting like he used to. And there’s some things he’s not comfortable doing. But when he gets his footwork down and he gets that jump hook, it’s automatic. “I’m inspired, impressed. Just seeing him run and up and down the court, working hard, even when he’s tired, he is still getting after it, trying to compete. Then on Sunday, the Rockets held a light practice in front of Houston fans. There was one part where Luis Scola tried a 180-degree tomahawk jam that didn’t work out very well, and all of the players had a huge laugh. Click here for more photos from Sunday’s practice. Rick Adelman is so pleased with Yao’s progress, it looks like he may want Yao to play longer in scrimmages. To accomplish that, Adelman may hold him out of practice every other day to give his foot enough rest to not overdo things (click here for the Houston Chronicle story). Yao is cool with trying different things. 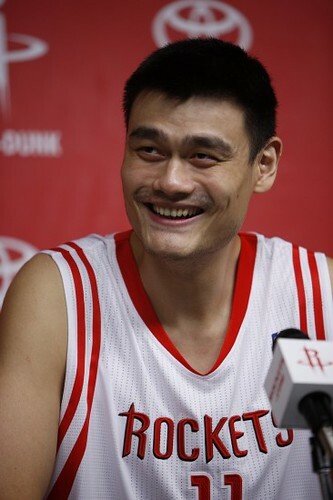 It was good to see Yao Ming back in a Rockets jersey yesterday at Rockets Media Day! It had been so long, it’s easy to forget what he looked like in a Rockets uniform. You can check out all the photos of Yao and his teammates in the forum, thanks to Raymond. Here’s also a link to his video interview in front of the Houston press. 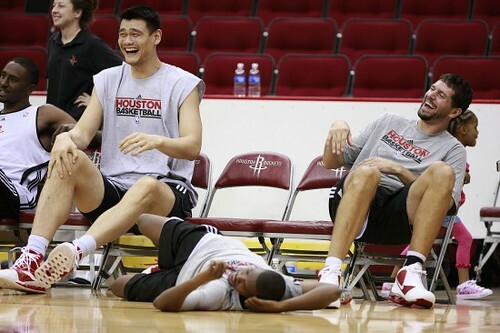 As usual, Yao was cracking them up. After Media Day was over, Yao took some time to visit a child in the hospital who is recovering from open heart surgery. Click here to see a photo and read the story. You are currently browsing the archives for the Rockets training camp category.